There are plenty of benefits that come with living the tiny lifestyle. Flexibility, freedom, and ease are the advantages that usually come to mind, but reducing your environmental footprint is another big bonus. Reducing living quarters doesn’t automatically make your lifestyle more eco-friendly, though. There is plenty more to it. That’s why it’s important to develop some of these green habits while living life on the tiny side. Look for Energy Star options when replacing outdated electronics and appliances to save energy and money. One stainless bottle can replace your daily water bottle, coffee cup and thermos. Using one for all 3 eliminates waste and clutter. To save on lighting usage, use windows and natural light as much as possible throughout the day. Do your research on the items that you buy regularly. Ingredients, sourcing, and manufacturing all play an important role and impact what we buy. Make more of your meals at home. You’ll save on food waste, save money on take-out, and save on emissions on driving out to eat. Plus, you won’t be discarding any plastic take-out containers. Now that it is spring, focus on using less resources and enjoying your environment – spend your time going on a hike, check out the local farmers market, or organize a community garage sale. Make conscious decisions regarding your consumerism. Buying, storing, and using too many things can contribute to stress and waste. Grow your own food. Even if you live in a small space, you can still grow your own herbs. Not only will you save money at the grocery store, but growing your own food helps you to de-stress. Did you know that the materials that you use on your roof can make a dramatic difference in your home’s energy efficiency? When it comes time to replace what you have now, be sure to consider a product that offers green benefits. Rainwater harvesting systems are a fantastic way to save on your water usage. A rain collection system is simple to install and can be hooked up to sprinkler systems. Use your landscaping to your advantage! Planting trees can protect your home from direct sunlight, keeping it cooler. Try to challenge yourself by donating or getting rid of 5 things a day. If you did that every day for a month, you would have successfully downsized by 150 items. Continue on that path for as long as necessary. For those items that you aren’t sure if you will need, put them in a box in the closet. If you don’t open that box within 6 months, then it’s time to donate it. Measure the space you live in now, then measure off 200 square feet (or the size of the tiny you are thinking about moving into) to get a feel of what it will be like. Challenge yourself to live only in that space and see what it feels like. Take notice of everything that you use on a daily basis and make sure you include it in that space. 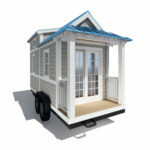 Once you know what items will be going with you then you can decide how much, and what kind, of storage you will need in your tiny house. Perhaps you need a tall closet to hang dresses or dress shirts. Or, maybe you don’t wear those types of items, so you need a lot of shelves to store folded items on. Maybe you like to snack and cook, so you need a lot of cabinet space in your tiny kitchen. Be sure to check the height of the containers of foods that you regularly cook with, so you know how high to build the shelves. If you have a lot of shoes, you’ll need an area by the door to use for storing them all. If you have a cat, where will you store the litter box? 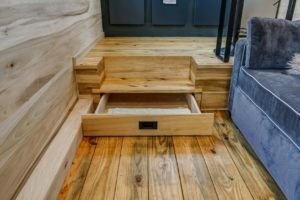 Storage areas can easily be built into your tiny house; however, you should have an idea of what you will need before you start the build. This way you can be well prepared and won’t be scrambling to pack it all in at the end. 84 Tiny Living has partnered with Alyssa Bean and Dan Mini on an exciting new project! 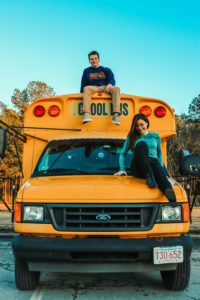 Alyssa and Dan, with the help of Skoolie Homes and ourselves, are renovating a school bus to live in and travel to all 48 mainland states. They made the decision to pack up their lives and put it on wheels to chase after the myriad of experiences that America has to offer. 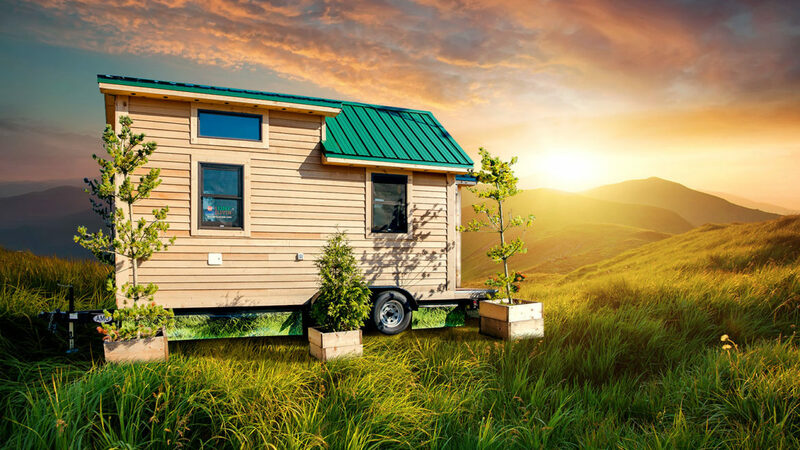 To live tiny, whether it be on a bus, or a tiny house on wheels, is a commitment to living intentionally and experiencing the freedom that that offers. We are thrilled to be a part of their journey! Everyone has been working hard to get their renovation complete so that Alyssa & Dan can start their journey across the US in January 2019! 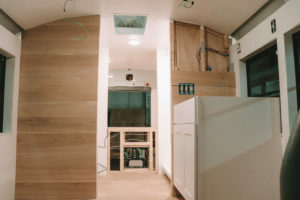 Skoolie Homes, arguably the most well-known bus conversion company, has been working diligently on the build with materials from 84 Lumber. Our associates are all in on the build, with custom features from 84 Tiny Living, 84 Millwork, and 84 Sign Shop. We’ll be posting updates to our blog and social channels along the way! Be sure to check out their pages and follow along with us to see what’s to come! Throwing a (tiny) dinner party. 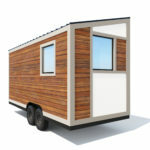 FACT: When converting to a tiny house your lifestyle will change. You will need to get rid of some items. Your cleaning routine will be altered. You will become more aware of the space you once occupied, for better or worse. Fortunately for you though, there are just as many things that will not have to change. You can still bring your own sense of style into your home. You can still cook yourself meals whenever you want. And, you can still have friends over and host dinner parties. Here are some simple tips and tricks to help you throw a party in your tiny space. Clear out the clutter. Living in a tiny house, there isn’t much clutter, but if you aren’t planning on using it for the party, put it away. You want to be able to take advantage of as much countertop space as possible. Take advantage of outdoor space if the climate permits. 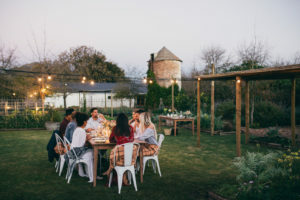 If you are hosting your party in a warmer climate, consider having it outside. There are places where you can rent a table and chairs, if needed. Hang up some string lights and set up an outdoor speaker for a chill vibe. Just be courteous and let your neighbors know what you are planning. Keep the menu simple. This is something that I struggle with. I love cooking big, extravagant meals, but the truth is, it can be very labor intensive for a large party. Nothing is wrong with a good cheese tray, one-skillet dinners and ice cream sundaes for dessert. Make it a potluck. I hate going to a gathering empty-handed. Plan to cook the main dish and appetizers, but let some of your guests bring a side or dessert if they please. Serve food that requires minimal plates and utensils. If there isn’t a ton of room for your guests to sit and eat at a table, you need to ensure that you are serving food that can be eaten standing up. That means nothing that needs to be cut or held with 2 hands. Keep the air moving. Packing several people into a tiny space can result in not a lot of air movement. Consider how you will cool the space. Designate a space for the stuff. Depending on the time of year, your guests may come with coats. Make sure you have a space to put these that are out of the way, like your loft. You don’t want to lose precious seating because everyone is throwing everyone their jacket over a chair. With a little planning, your tiny space can be just as functional as any other! And a little more cozy! 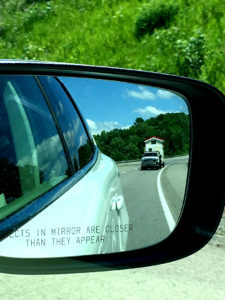 Last month we discussed a few of the roadblocks to owning and living in your tiny house. If you haven’t seen that blog, take a few minutes to go back and read it. However, some states do allow Accessory Dwelling Units to be built and used. These are tiny houses built on foundations, with a secondary residential dwelling located on a single-family lot. In other words, a tiny house is acceptable if there is another, larger (standard sized) house, that meets the zoning and building codes, on the same lot. A citizen is able to apply for a variance through the local planning commission to build outside the existing codes. Some states are more progressive than others, so if you’re thinking of moving look into these places: California, Colorado, Florida, Massachusetts, Michigan, New York, Oregon & Texas. 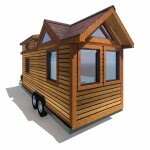 There is momentum behind the Tiny House Movement to permanently change the zoning regulations. 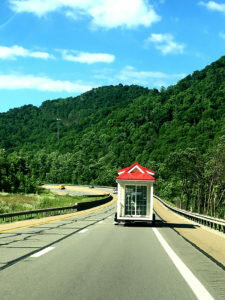 Tiny house advocates are currently pushing to include a tiny house code in the IRC that would become a model code for all tiny houses used as a primary residence within the United States. 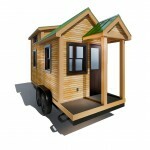 Code would ensure that safety regulations are created and met by all tiny house builds. Ownership of a tiny house may be tricky right now, but it isn’t impossible, and we want to help you accomplish your goal of living in one. Contact Us with your questions and we’ll see how we can help!